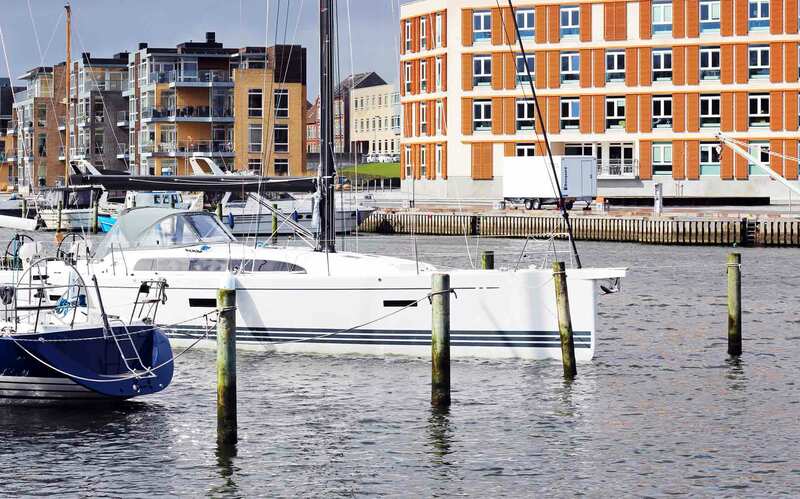 Top Notch Performance Cruisers: X-Yachts of Haderslev. I just love Denmark. Why? It´s a country with a rich culture and history (the Vikings! ), it is situated between two oceans, the Baltic Sea with the admirable Danish South Sea and the wild, aggressive yet beautiful North Sea shores. So, having a couple of days here in Denmark is always very relaxing and nice – and, bonus, here we have some interesting yacht manufacturers and thus a lot more to see. 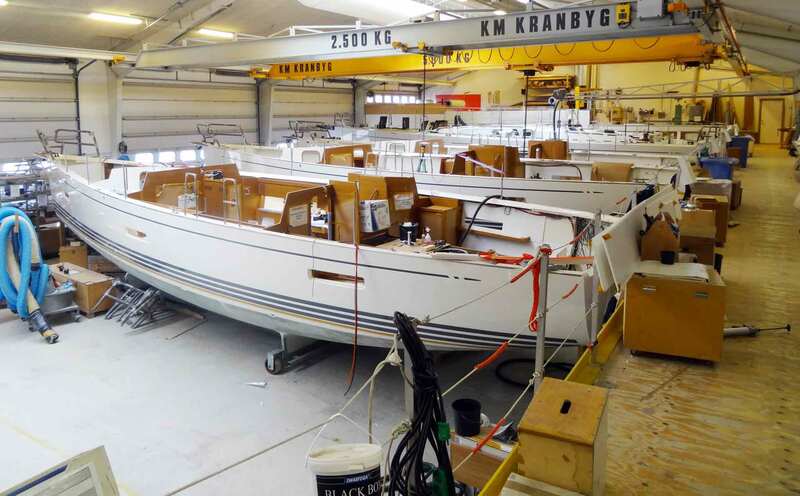 Just 2 days after my visit to Luffe yachts in Kolding (which can be read here) I was humbled by the chance to have a look onto the yard of famous X-Yachts in Haderslev. 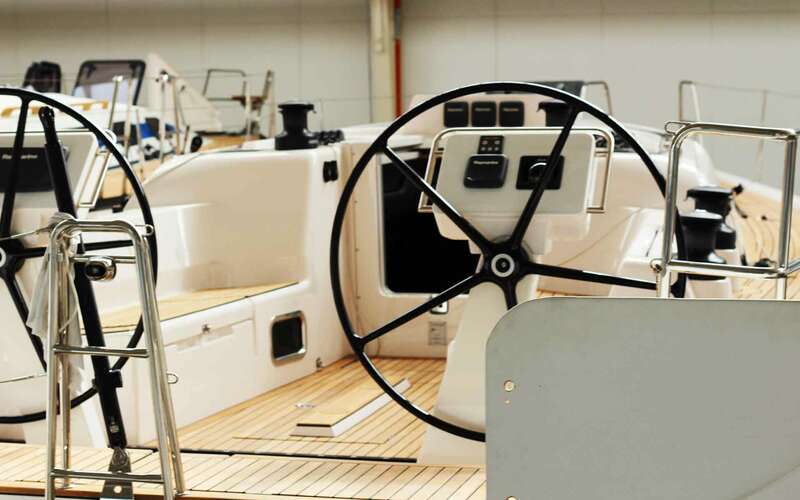 X-Yachts has been founded 1979 – the year of my birth – and has since then a growing number of enthusiasts, fans, admirers and owners of course who swear these boats are the best you ought to buy when it comes to performance yachts. I am greeted by Flemming Ancher, X-Yachts Sales Director and passionate sailor by himself. Flemming will invest some 4 hours in our meeting, will answer astonishingly open and freely and will show me around in the holy halls of X-Yachts with granting me a thorough, long and exclusive look onto the brand new model X4. I have spent 4 hours with Flemming Ancher (left) who was showing me around. This is why X-Yachts goes for quality. 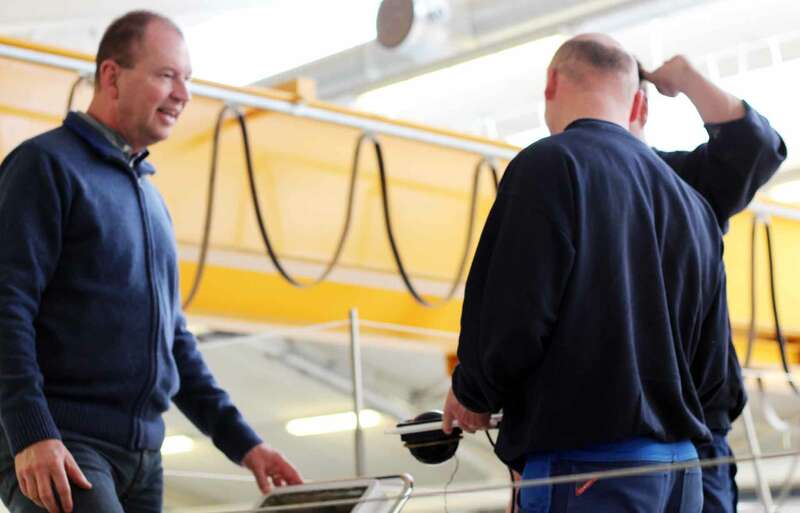 “You see, we want to make the best performing sailing yachts in combination with offering a unique sailing experience. That´s something we are always trying ourselves to get constantly better at with each new boat.” Example please. Flemming says, that sailing performance is a combination of a perfectly designed hull that must not be too wide: “This means less volume, we know that, but our boats are simply sailing faster than those roomy wide ships built by others.” Secondly and most important: “A yacht that is built for performing well above all has to be stiff. 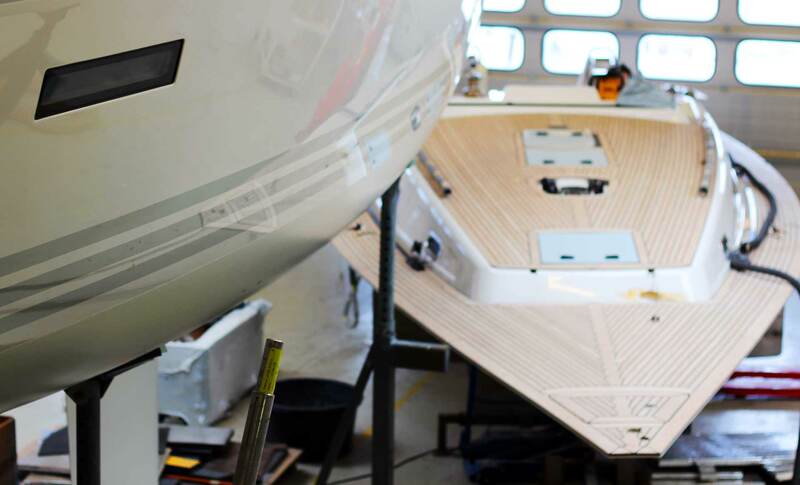 That´s the basic groundwork of our design philosophy: A stiff, stiffer, stiffest hull!” This is what the designers – and on top of the list is owner and chief-designer Niels Jeppesen (whom I´ve had the pleasure to talk to about Scandinavian Sailing Philosophy, read here) – are striving to achieve with every single new boat made here. Made here? 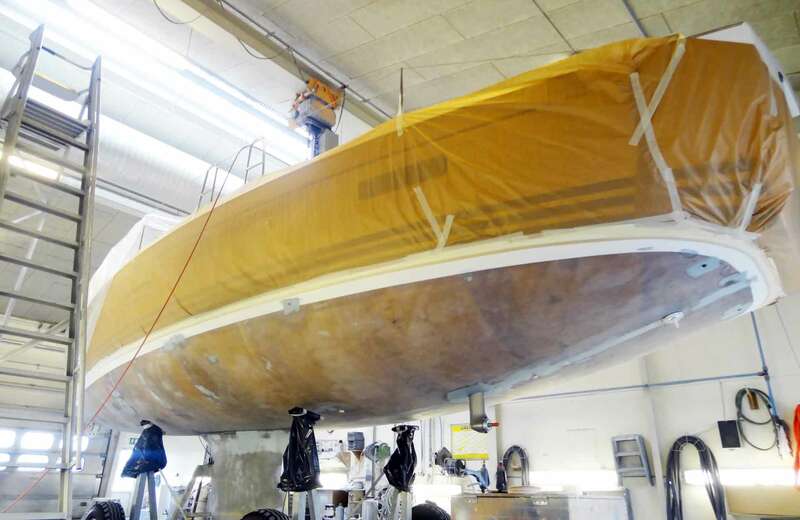 We proceed into another big workshop where we stand next to a nice “little” boat: “This is our Xc 35”, says Flemming pointing to her sleek white hull with the distinct three stripes at the waterline, a trademark design of X-Yachts: “We did build this boat to attract young people. It´s our smallest boat yet offering all the advantages of an X-Yacht such as superior sailing qualities and luxury. 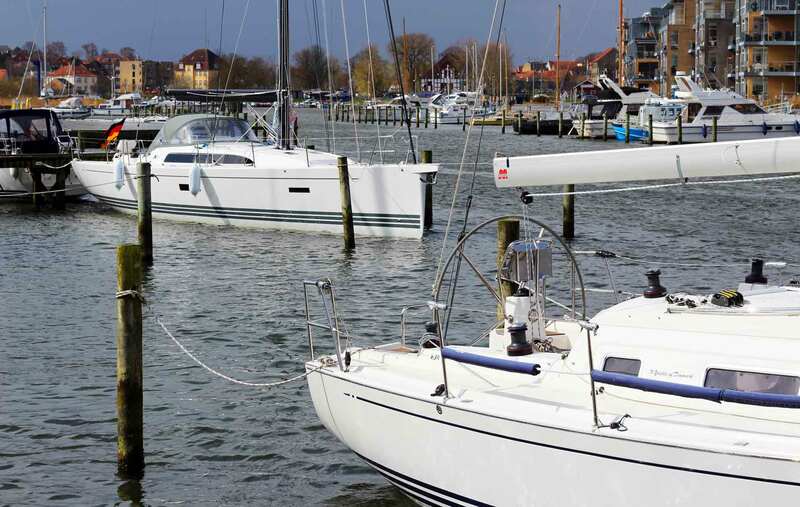 But we have a problem …” Flemming explains, that it is very hard to get young clients to invest in a new ship (as I would resemble his target group perfectly, a starter in sailing, but I did opt for a used yacht too.) “Our clients are very, very loyal indeed. We have people buying their sixth X-Yacht here. But getting them connected to the brand is hard. That’s why we have built this Xc 35. We do not make a single Euro profit with that ship.” My jaw drops. “Believe me, this is not making money at all. 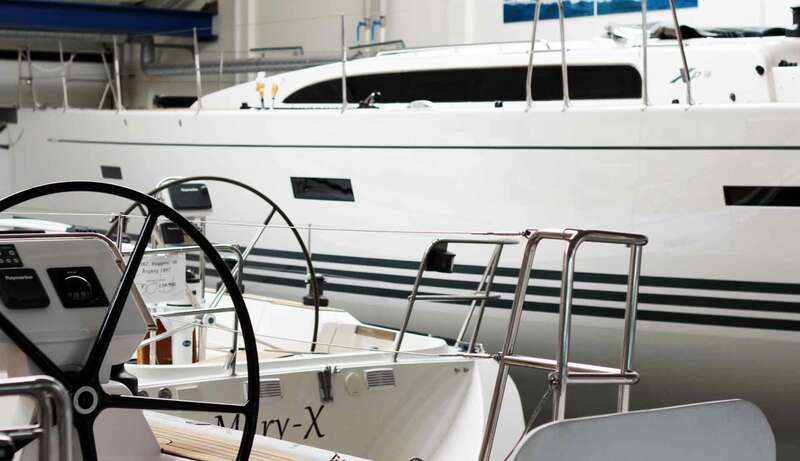 We want to attract young buyers and have them enthused for X-Yacht quality. 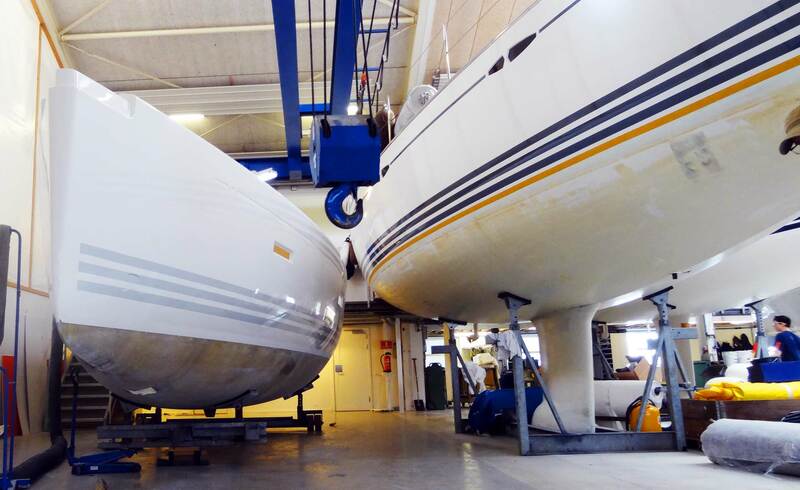 When they get older it´s our intention to have them as costumers for the bigger boats.” Just to get people attracted? Seems like a clever yet risky strategy … a brand new Xc 35 does come with a 200.000 Euro price tag. The Xc 35 is the smallest yacht in their range. The Xc does incorporate everything that an Xp does have but with a strict emphasis on safety. “We went through the whole of the construction of the Xp and have asked ourselves: Would we really send somebody with this and that on a three year circumnavigation?”, Flemming says: “And so we did replace the carbon cage by a steel-made frame, the carbon mast with a well-tried aluminum mast just to be 110 per cent sure, added a little more volume for stowage and space and yet – this yacht is also faster than expected and performes so well!” One might compare an Xc to an Hallberg-Rassy in getting performance and sturdiness and a beautiful boat. 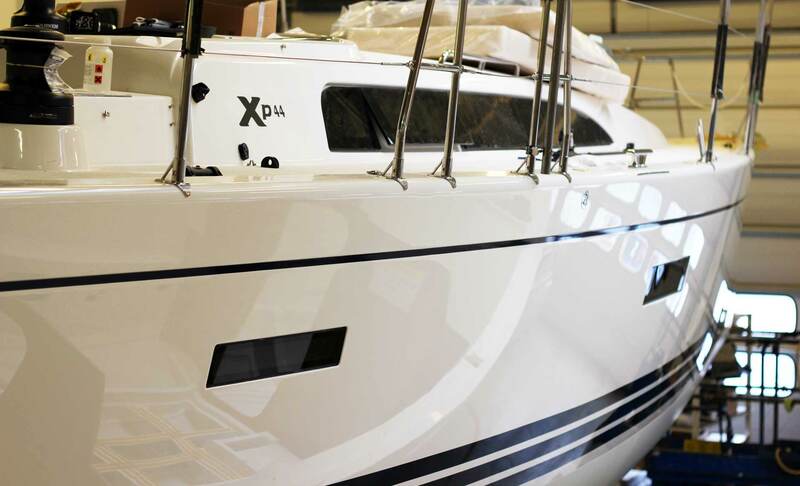 X-Yachts sales devide nearly 50-50 between Xp and Xc with a slight tendency to the latter. We stroll about and I come to see my absolute favorite yacht of the whole range. “Oh yes, the Xp 44. That´s a true beauty, I know!”, it seems that even Flemming has a crush here. We enter another hall where I can see five or six boats in different stages of the built. The hulls are side by side and workers are roaming about fitting different things to the ships. There´s no noise at all and despite people being busy to work through their tight schedules every time we walk by they seem to have a second to take a look, give a friendly nod or greet us. I can observe all the different stages of building a hull. 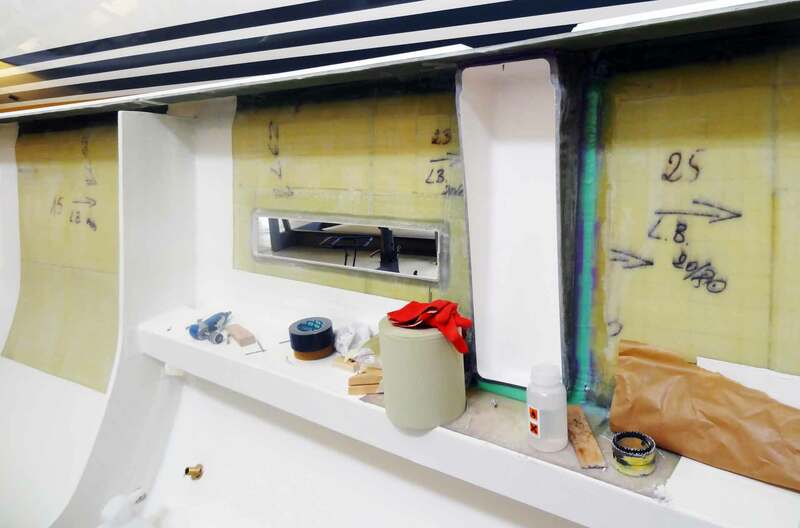 First the lower main shell is outfitted with everything from piping, cables, engine and saildrive, furniture and woodworks, tanks, electronic equipment and lighting – the complete interior will be installed and thoroughly tested prior assembly. 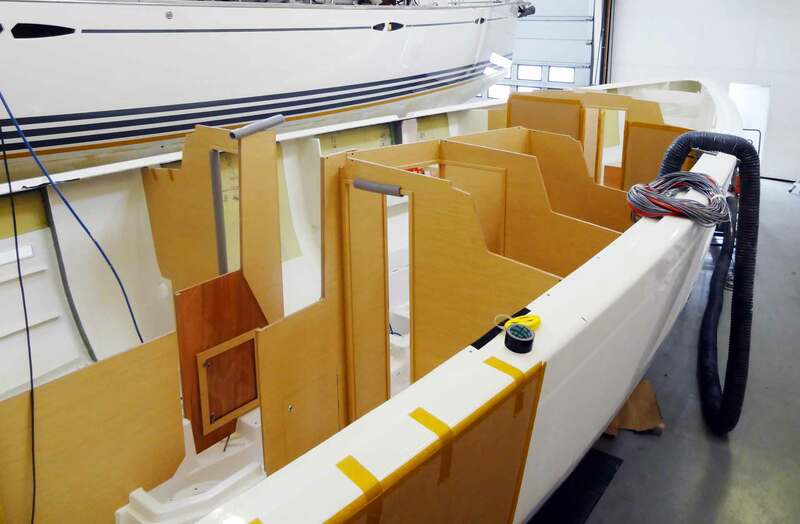 Then the “marriage” takes place: With a crane the upper shell – or the deck – will be lowered, bolted and glued to the hull. When the upper shells arrives, it will come fully operational. I ask whether every X-Yachtv still breathes the spirit of Niels Jeppesen. 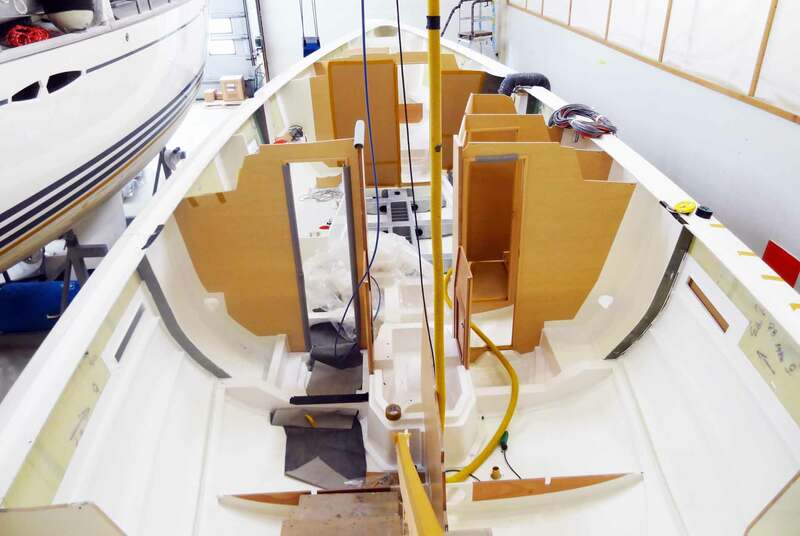 “Oh yes, Niels is not just a name giver or some kind of a e-minence grise”, Flemming answers: “He is still drawing the lines of every single boat built by X-Yachts. Every single. That´s because we still learn. We are constantly trying to get better.” Niels lives in Southhampton, UK where he maintains a small office. 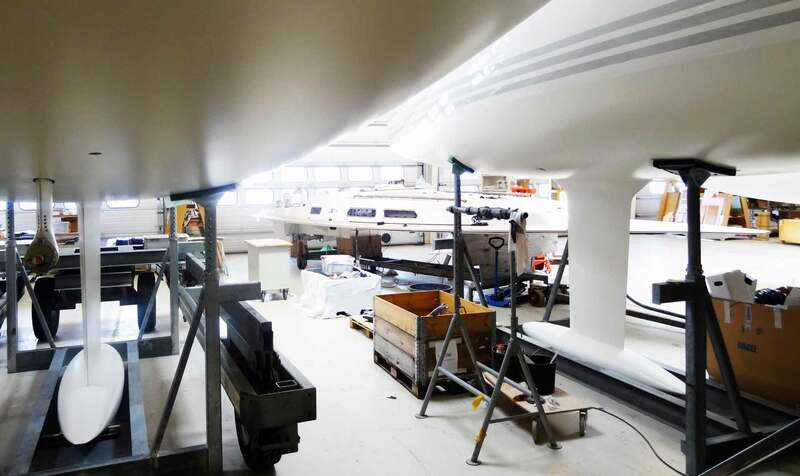 “Southhampton because he has his wife and family there and despite private things it´s where one of the most renowned universities for boat design has it´s headquarter. 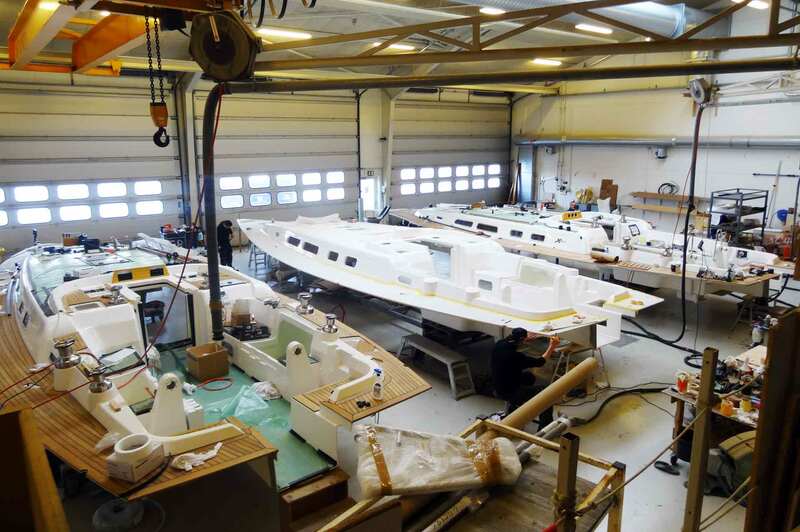 So it´s good to be there to have all these young, talented and motivated new boat designers in one place.” Still, upon submitting his drafts, the bulk of the work is done in Haderslev, Denmark. As we enter the hull – a 40 feet boat – I can clearly see the thick frame. It´s made of galvanized steel. A solid thick main frame right in the middle of the hull directly above the keel forming the later bilge. 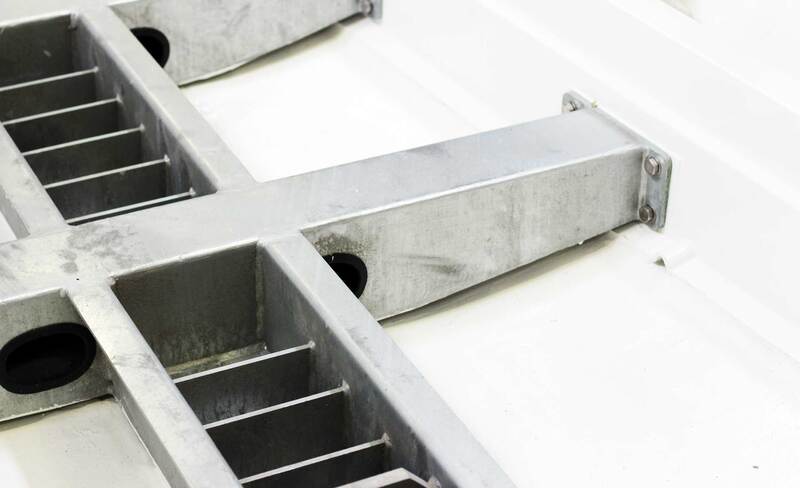 The steel seems to have 2 centimeters in thickness with a lot of bracing adding to rigidity. Three massive arms will derive from the mainframe to either side of the boat. There the arms are bolted with massive screws to the GRP-hull, bearing huge stringers in this section. “Looks awesome, doesn´t it? With our Xp-models this cage will be made of carbon”, Flemming explaings, “which will reduce weight significantly. As this model is a cruiser we opted for steel.” I can imagine that hitting a reef or a stone with the keel would produce huge forces which could result in cracks of the carbon cage. “This is what I meant we added safety to the cruising models. 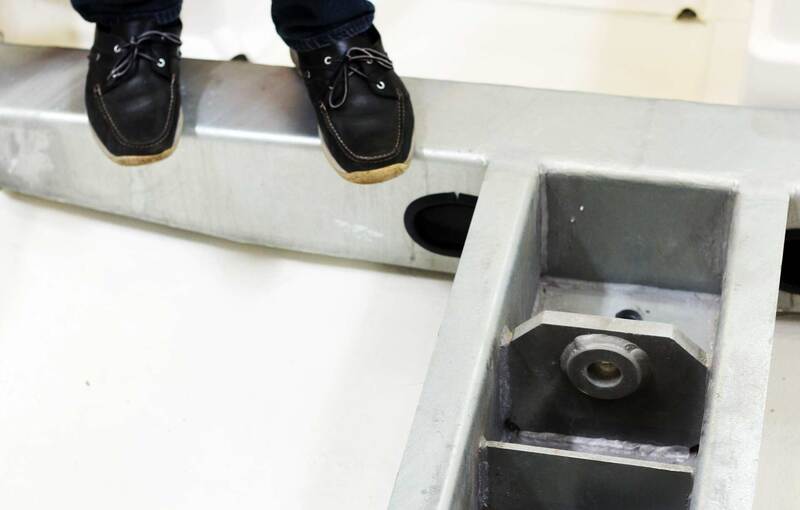 Running aground can happen when cruising, happen more often that running aground whilst racing, so we opted for steel here.” Nevertheless, I can imagine 2 centimeters of carbon indeed is very rigid as well. 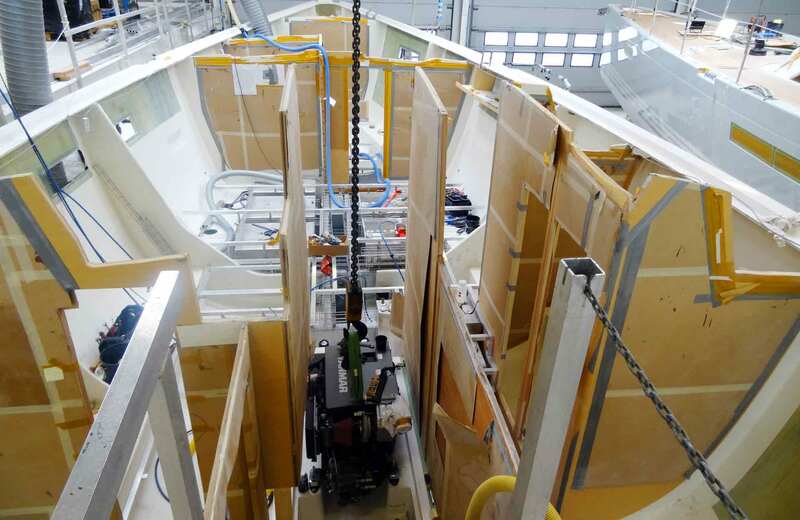 We took a look from above and I could clearly observe the unfinished interior of the boat: This was the 3 cabin version with two large aft cabins and the big fore cabin, two heads, but as Flemming promised, there will be two more options to have the X4 customized with one head or even one big aft cabin. 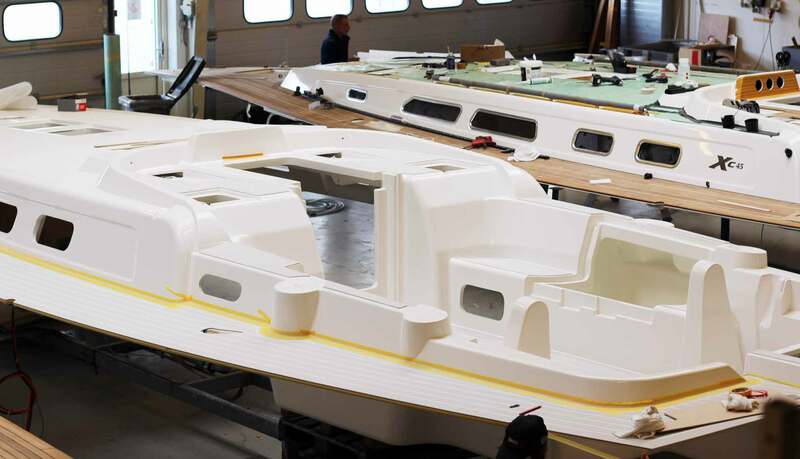 “With the X-line we try to add something new to our product range,” Flemming explains: “You have the Xc-boats for cruising, Xp-boats for sportive sailing and the smaller Xr range for racers. And with the X-line it´s a new approach. You see, our cruisers are timeless beauties. But we´ve had the feeling that a lot of owners want something more modern, more contemporary.” And this is how the X-line was born: High performance plus modern straight design. The boat has a length of exactly 41 feet or 12.50 meters. A maximum beam of 3.95 meters and thus offering a spacious interior. “The owner´s cabin in the fore is huge”, says Flemming pointing towards to bow. It´s something like a master bedroom, light filled and roomy.” Looking to the aft cabins I notice the huge bathroom on the starboard side: The entry door to the cabin gives way to the lavatory on the left hand side, a huge drying locker for wet clothing and on the right hand side into the double berthed cabin. The woodworks air friendy and lighty colors and everything appears made with an emphasis on modernity and quality. “It will be a fantastic ship”, says Flemming, seemingly proud. Proceeding into the saloon I again notice the sturdy steel frame bolted to the big stringers at each side of the hull. Flemming points towards the left and right parts of the bottom of the hull: “Here both fresh water and Diesel tanks will be mounted. As a matter of fact, it proves that putting heavy parts – such as tanks – to the lowermost part of the ship adds to her sailing properties and stability.” These tanks will be situated not only deep down in the ship´s hull but also near the center – the X4 will be a well-balanced boat. 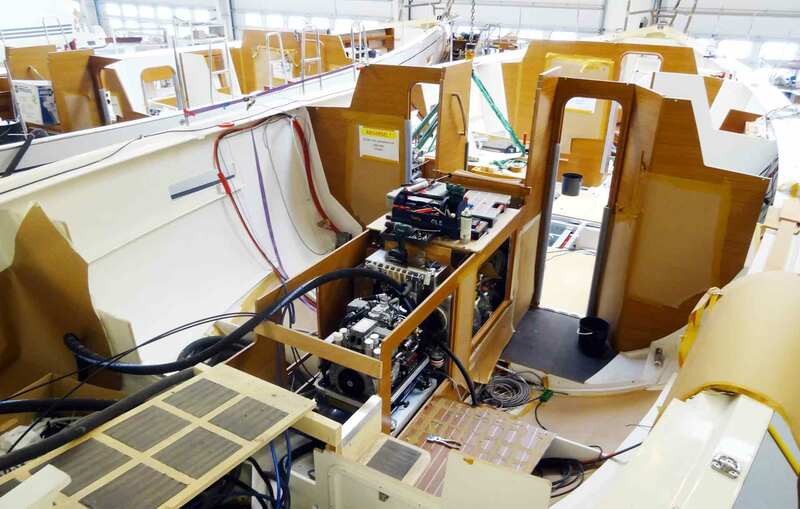 Looking abaft I can see the then empty engine room with the massive footing and outlet of the saildrive, left and right of which the two big aft-cabins are clearly visible. 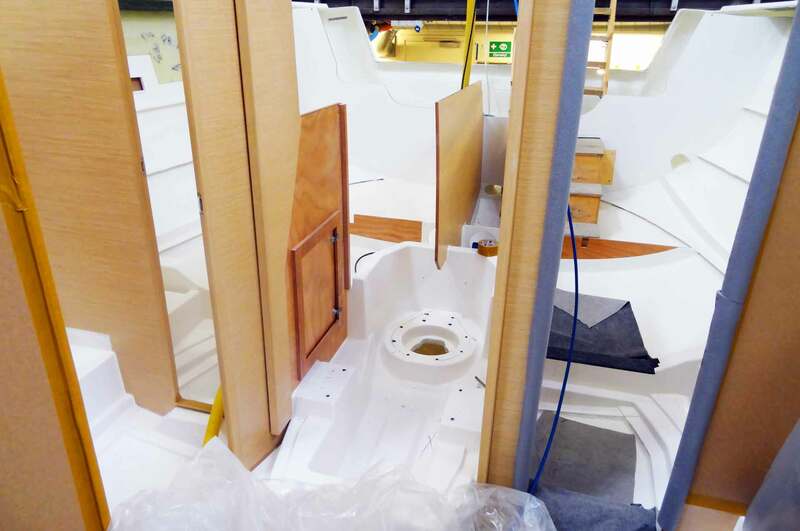 Each cabin will have its own small stateroom with a drying locker. “With the X4 a crew of 6 people will find it very luxurious to travel around, though we do have two more berths in the saloon.” But if travelling with 8 people would be such a good idea … this is a decision of its own. We proceed to the outside of the hull where I can observe the still uncovered GRP/epoxy material. 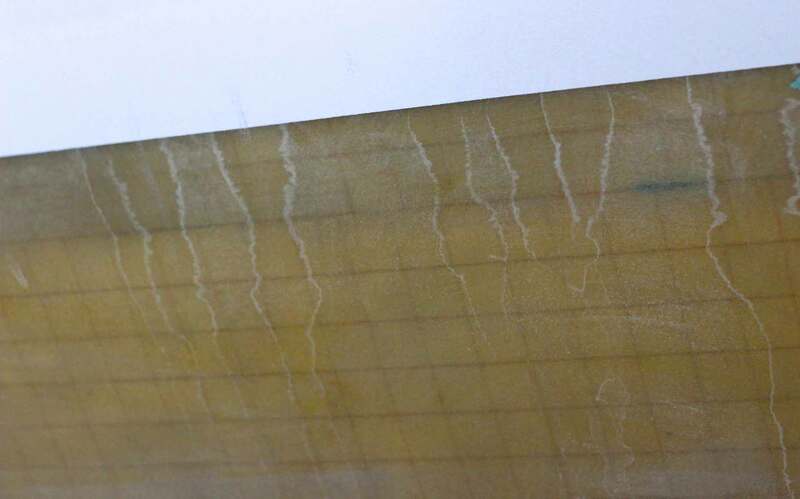 “You can clearly see the knife-cut M-foam here.”, says Flemming: “As I could see it with other brands where the foam is cut by saw, this leaves big sections between the foam-squares. These kerfs have to be filled with epoxy which in our view is a waste of precious material on the one hand and doesn´t add to stiffness very much on the other hand.” Knocking on the hull produces a full sound but to be honest, I have to trust Flemming regarding this point as knocking on the thick hand laminated GRP hull of my 40 year old King´s Cruiser will produce a similar sound. 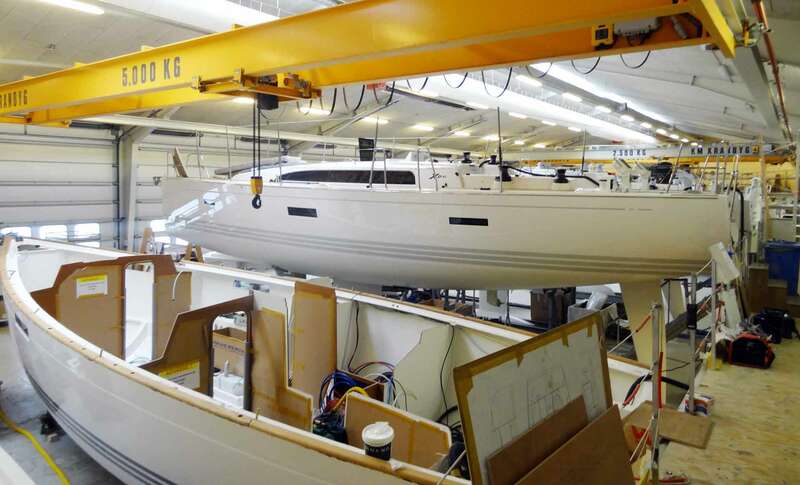 The X4 will see water within the coming weeks as she is scheduled to go on sea trials soon. 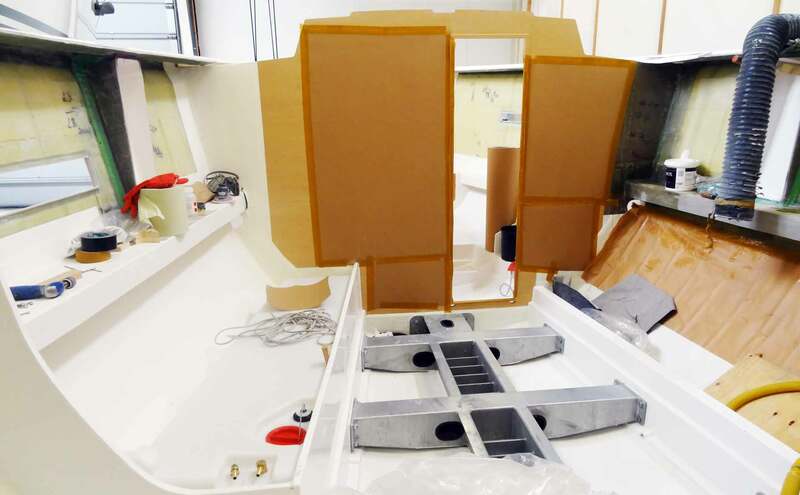 “We want to have the first yachts of this new type delivered in Summer 2016”, says Flemming: “And there´s a lot of work still ahead.” I can see it: The hull misses her keel, engines and electrics have to be installed and there´s a rig to be to be mounted still. 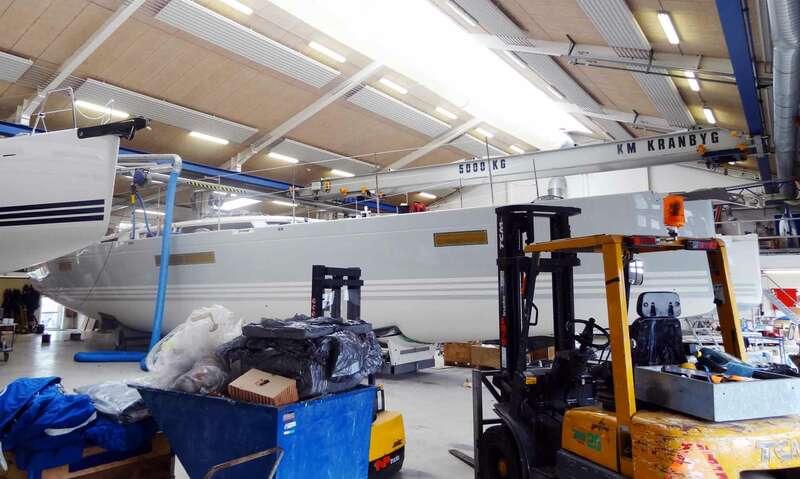 We leave the unfinished X4 001 and I have the impression that this is going to be a very beautiful boat. Additionally I do like the 40-feet-class as this size offers in my eyes the best compromise between “big enough to offer some space” and “small enough not to cost too much”. In any case, an X4 is way out of reach for me here. Speaking of out-of-reach: Proceeding through the hall back to Flemming´s bureau we pass two more hulls. Big ships. Grey color, again, three stripes of X-Yachts at the waterline: “Impressive!”, I say. Flemming points towards the hulls: “This is the X6, our new flagship.” This battleship will have a length over all of 63 feet, being 5.4 meters in width at her widest point. This is truly a big ship and a redefinition of building a yacht for X-Yachts. Taking a look into her hull again I am astounded of the vast variety of huge cabins: The X6 will offer three to four cabins and a whole new experience of luxury. As I stand in the unfinished saloon with its some 360 degrees view. Clearly, this yacht is a nice sailing toy for somebody who already has everything. But putting luxury aside, I am looking forward to see the X6 in the water under full canvas. The massive 60 feet X-Yacht – unimaginably huge! X-Yachts is reacting to a market of growing sizes and richer people wanting bigger boats as anybody can view when taking a look onto the 62 feet X6 sailing yacht. I am still glad that despite these megalomaniac projects they are still building yachts of convenient sizes such as the 35 to 44 feet range. And as we walk through all the hulls I´ve had the pleasure to visit today we come alongside my all-time favorite: The Xp 44. 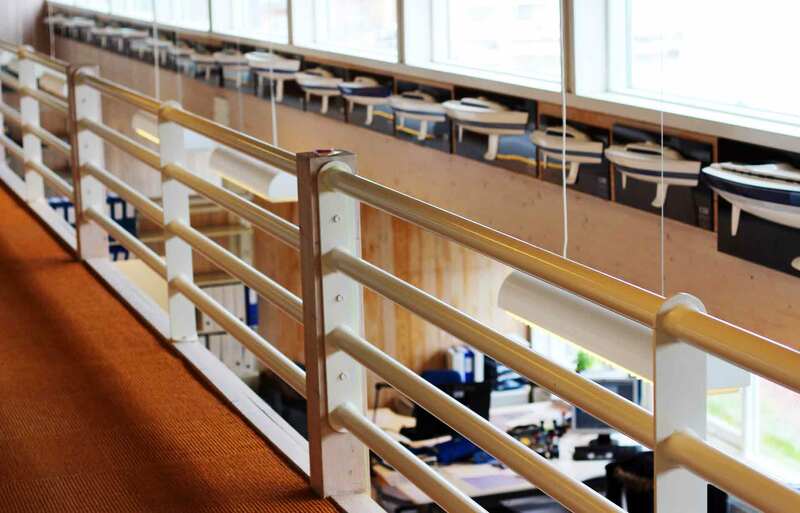 As we proceed into the office of Flemming I thank him for taking his time and showing me around, answering all my questions and letting me take pictures of every corner I wanted to have a look at: “You see, we have no secrets. Building yachts is no rocket science”, he says and laughs: “Building good yachts on the other hand needs dedication and a strong will. We don´t want to make a product that suits everyone. I often hear the complaints of high prices and stuff. But I must say – looking at this Xp 44 – what do you want? 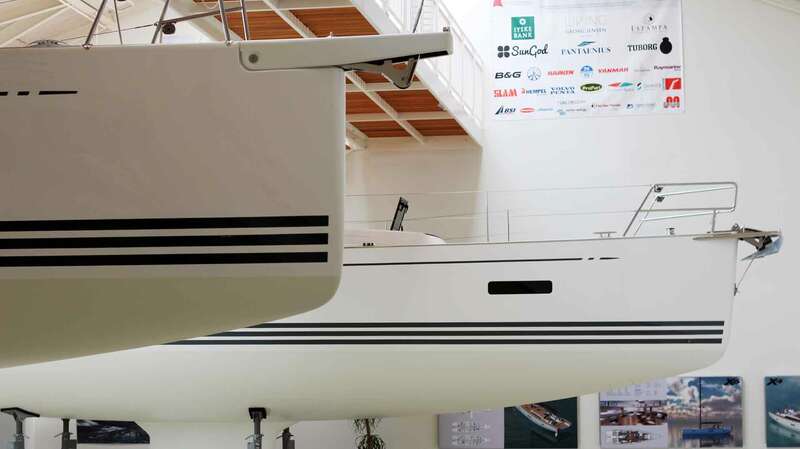 Do you want high quality, a stiff hull and superior sailing performance? Than you ought to be willing to pay the price for it.” Flemming describes the ongoing discussion about pricings with buying a car: You can´t go for a Porsche but willing to pay for a Fiat. “I know that other brands sell their yachts for half of our price. I know that.” He is referring to the big brands like Bavaria, Beneteau or Hanse: “But you know what? They put out a hull within three days. It´s not good. This is my firm belief. These hulls are soft compared to ours. Of course, they offer a lot of space but they won´t perform well.” He also refers to the built in equipment: With X-Yachts the stable, lighter and yet better performing rod rigging is a standard commodity, just as Anderson Winches of Veijle not too far away from Haderslev, a well known brand with which X-Yachts has a long standing tradition of outfitting the boats are working together for new developments. “An X-Yacht features an holistic approach to sailing – to superior sailing”, Flemming concludes our wonderful forenoon. Thanks for this wonderful yet inspiring day at X-Yachts! As I am saying goodbye to Flemming I cannot really leave the compound. Too much do I feel drawn to these wonderful boats: I really like X-Yachts for their understating design yet their clean, very distinct lines. The white hulls, black carbon masts, low freeboards promise the hell of a ride. As I am strolling the company´s own small marina where the boats are finally outfitted for the handover to their new owners, it´s again the Xp 44 I am admiring most. 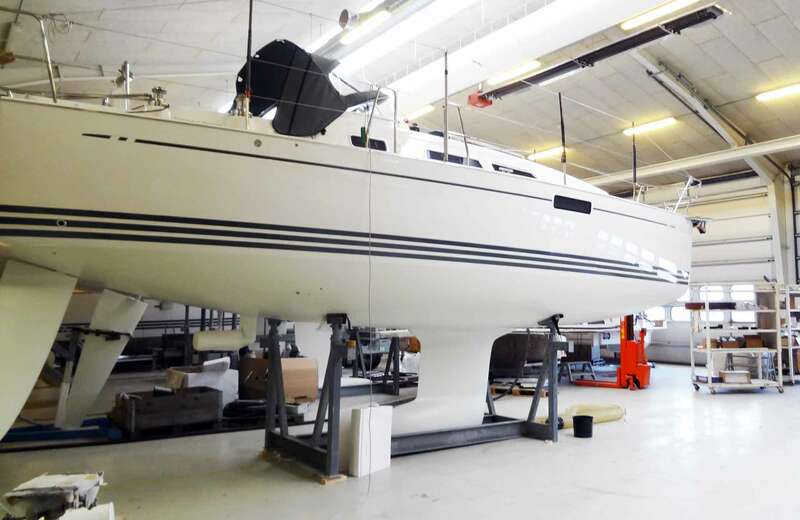 I look forward to the coming season and hopefully a chance to see the X4 floating – if not so, then at the latest during the upcoming Hanseboot-fair here in Hamburg, where I had last year admired X-Yachts as well. Thanks Flemming Ancher for taking me around & Greetings to Haderslev. From 1979 – 1985 my Father Kristan Bøge has maked 500 pices of X79, X95, X102, X3/4 Ton and Xone Ton Boats in Lunderskov. I am interested in owning a used Xp 55 to 65 yacht for racing and cruising. They seem to be well built.